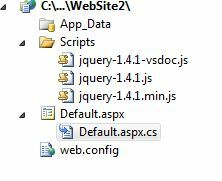 In this article we will see how to call an ASP.NET C# method (Web Method) using jQuery. Add a jQuery reference to your project. Add a web method in your page as mentioned below. This method simply returns the Server Date time value as a string and the trick is it's a "Static Method", otherwise it won't work. We will use a jQuery "Ajax" method to call, page methods. The URL value will be the page name/method name and the data will be the optional parameter to pass the value to the server. Now we will call the C# methods and get the post back server data without a page refresh. This is one way to access the C# methods.